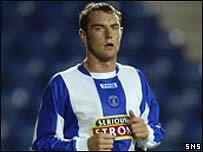 Wolverhampton Wanderers boss Dave Jones has pronounced himself impressed by trialist striker Kris Boyd. But the 19-year-old has returned to Kilmarnock without the prospect of an immediate transfer. Boyd was in the West Midlands for a three-day trial with a view to a permanent move and will now monitor his progress during the coming season. Jones told his club's official website: "Kris has gone back to Kilmarnock to prepare for their game against Partick Thistle this weekend. "But we liked what we saw and we will be keeping a check on the situation." As disclosed by BBC Sport on Saturday, Scotland Under-21 international Boyd had impressed Wolves' chief scout. But Jones wanted to have a closer look himself at the powerful forward. Killie manager Jim Jefferies said: "They have been watching him and like what they see." Like most SPL clubs, Kilmarnock are desperate to reduce their debts and Boyd could bring in a sum of at least £250,000. Wolves have already plundered Scottish striking talent, with former Hibernian and Rangers striker Kenny Miller proving a hit last season as promotion was won. Former Hearts midfielder and fellow Scotland international Alex Rae are also on the books of the Midlands club.